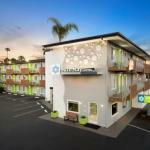 Superb location is one of Inn at Mission Bay Seaworld´s main features. You can be at Seaworld and Pacific Beach in just a few minutes! Belmont park and Balboa park with more than ten museums including the Museum of Art and the Reuben H Fleet Science Center. Enjoy watersports in the lake or relax on the huge lawn of Misson Bay park, the largest manmade acquatic park in the world!Travelers can enjoy San Diego sun at the outdoor heated pool and relax at the recently renovated rooms and ample lounge. If you are on business, San Diego Convention Center is minutes away. Wireless Internet access is provided in every room so that you can finish your report or presentation in the hotel´s relaxing atmosphere. The hotel breathes calm. All the rooms have just been renovated now including high-speed wireless Internet access and Premium cable TV. You can warm up food in the microwave and have your stock of cold drinks in the refrigerator. The rooms include one or two Queen beds. You can make free phone calls from the room. Between 7 and 10 in the morning, guests at the Inn at Mission Bay Seaworld enjoy a complimentary deluxe continental breakfast. Travelers can buy discounted tickets for San Diego most popular attractions such as Seaworld, San Diego Zoo and San Diego Natural History Museum. Visitors can relax at the outdoor heated pool and enjoy the Californinan sun. The hotel offers free parking.